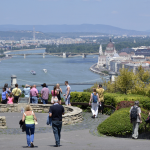 Guest nights spent in Hungarian commercial lodgings increased by 1.6 percent year on year to 1,903,000 in December, the Central Statistical Office (KSH) said on Tuesday. Nights spent by domestic tourists went up 2.3 percent to 951,000 in December while those spent by foreign visitors inched up 0.9 percent to 952,000. Revenue increased by 6.7 percent to 38 billion forints. Average occupancy in hotels was 52 percent, up 0.4 of a percentage point from the same month a year earlier. Total revenue per available room (TREVPAR) at hotels climbed by 6.2 percent to 20,510 forints. In the full year of 2018, guest nights grew by 3.8 percent year on year to 30,914,000.